- Shares common platform with Mimesis 24/30. - Superb AC3/DTS decoding; AAC ready. - Superbly built remote-control. Milled out of a solid metal block, same as Mimesis 24/30. - Superb Swiss-made built quality. When implemented properly, the SR8 does offer unparalleled sonic advantages (high S/N ratio, distortion-free clarity, dynamics and high-bandwidth frequency response) over conventional analogue setup that runs a passive speaker crossover. The SR8 full digital setup offers a glimpse of what technology will bring to the future audio world, when audio processor are entirely DSP-based, generating far less consumer waste as people don’t’ have to be forced into constant upgrading as audio standards constantly evolves. With reference to the comments made on the deficiencies as identified in review summary section, both deficiencies of the SR8 can be easily, economically and efficiently rectified for prospective SR8 owners. With the first deficiency, viewing from a cost-effectiveness and from a functional perspective, if one needs >8 channel mixing/routing support, one would be far better off augmenting the SR8 with a Yamaha DM-1000v2 Digital Production Console (like I did), which offers full 24-bit/96kHz digital mixing/routing capabilities supporting 48-channels simultaneous mixing, than spending it on acquiring the Mimesis 30 or 24, unless one has too much money to burn or a particular fondness with the 24/30. The 32-bit internal signal processing and 58-bit accumulator of the DM1000 produces first-class sonic performance, with no audible deterioration incurred. Performance-wise on the mixing and routing aspects, the DM1000 would not be any less than what the SR8/24/30 internal routing/mixing circuit offers (quite restrictive), if not better, given that many commercial CD/DVD are mixed using this console, at one stage of their production! (c) Mechanical isolation of SR8 and (b) on the X-Y axis using ceramic isolation devices, such as the Finite Elemente Ceraball Universal. I found having implemented (a), (b) &(c) to address the mechanical deficiencies, sonically the SR8 becomes on par with the Mimesis 30, if not very close to the 24 (both of which I have auditioned), given that they share so much in common in the design. SR8’s total mass does not benefit too much from full-mechanical grounding. It is comparatively light; going with full mechanical isolation offer far better sonic benefits. (3) Add Word-Sync clock I/O support. The SR8 internal construction is highly modular and there are no reasons why Goldmund cannot release hardware upgrades to the Universal Preamp series at a later stage. As it is, the coaxial digital output setup will not be too ideal to cover vast distances. SPDIF Coaxial cables do not like sharp turns. Running with AES/EBU balanced cables will be a better choice. I would advise prospective SR8 owners to get 4 Neutrik Digital Audio Transformers (NADITBNC-MX) and run the signal in balanced mode. For longer distances, the AES/EBU signal can be easily converted to utilize a Cat-7 (750MHz bandwidth) cable media (you’ll need to build the interface yourself, but it is quite easy), which offers excellent noise rejection and ultra-high bandwidth. Alternatively, one can choose to carry the digital audio signal (to the rear) via an optical-HDMI (v1.3) cable, by feeding coaxial digital to the video processor (such as Pixel Magic Crystalio2), then tapping the digital audio output from the projector end. I deploy both methods described above in my setup. 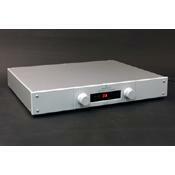 The SR8 has already been reviewed by Absolute Sound in 2006. This review will be presented from an end-user perspective, after having happily lived with the SR8 for almost 2 years. Whilst Alan Taffel’s review of the Goldmund SR System in Absolute Sound (2006) has provided some insight into the potentials of the SR8, I felt that it failed to do full justice to the sonic quality for the SR8 alone. I agree with Alan’s summary comment that the Goldmund SR system, as an overall system, may not be quite there yet (as various components are still evolving), to convincingly sway existing audiophiles to go with an all-digital system; but this shouldn’t imply that the SR8 unit cannot achieve this goal, when paired with more competent/appropriate system components with the proper setup to exhibit its full potentials. However I disagree with Alan’s summary comments in regards to the SR artifacts; specifically the “discontinuous dynamic shifts, curtailed note decay” are attributed to the digital processor SR8. Whilst this could be a valid observation during his review of the SR system on the whole, I found not such issue after having used the SR8 as a system component in my audio setup, for almost 2 years. Based on my previous encounters, during auditions with other high-end preamps/AV-amp involved (offerings from Mark Levinson, Krell, Theta & Lexicon), before deciding on my purchase, I concur that the SR8 is the best sounding preamp/AV-amp I ever experienced under the US$10k price point. The same view still holds true even for components costing quite a bit beyond this price point. To further substantiate Goldmund’s Universal Preamp’s accomplishment, it should be noted that the SR8 has won the “2006 Audio Excellence Awards” in the Pre-amp category; Mimesis 24ME has won the prestigious “Stereo Sound GrandPrix 2004” award. The Universal Preamp technology does have its merits. It is surprising to find that a large population of the audiophiles is not fully aware of the significance of factor (2). In fact, in many setup, just by addressing issue (2) alone, significant sonic improvements can be achieved in many aspects of the playback performance. No wonder the Asian (especially the Japanese) Hi-End audiophiles (with full active crossover setup being very common) were able to appreciate the full-potentials of the Goldmund Universal Preamp more easily, than the Western Audiophiles (it is disturbing to learn that so many $$$ systems are still running in passive crossover mode! These guys just don’t know what they are missing!?). What makes the SR8 solution unique, is when it is combined with a quality Digital Crossover system (such as DEQX PDC2.6p operating in Digital IN/OUT mode) that offers digital speaker correction (pseudo-anechoic, amplitude and phase) of speaker drivers and room correction, full-digital signal transmission and quality outboard discrete DACs, the overall sonic performance of the system immediate gets elevated to an unprecedented level, which may not be too familiar to most audiophiles, even though they may have plenty of contact with HiEnd audio gear. The common facial expression I see on my audio friends are ones that renders them speechless, in total disbelief! You know that an audio system sounds very good when their audiences persistently want to keep turn up the volume! What SR8 offers here is the opportunity – it is definitely not an off-the-shelf solution, in which it can address all types of challenges a particular audio setup faces alone. (2)	Fully exploring the “Speed” & “High Bandwidth” characteristics from Goldmund. There are many reasons why I wouldn’t go with a full Goldmund implementation. But if one utilizes the SR8, I would strongly advise to go with Goldmund’s JOB4/JOB5 (Monoblocs) for HF amplification, utilizing its 3MHz bandwidth and 1MHz flat response. Any offerings from Goldmund, JOB or StellaVox range will be good choice. Do ensure that the speaker drivers are of high sensitivity and wide bandwidth characteristics. And to fully enjoy, high power handling as well. I run a mixture of speakers utilizing Beryllium HF-drivers from JBL and JM-Lab as well as Diamond HF-drivers from B&W. In a proper setup, you will be amazed by how well the “Speed” and “High Bandwidth” properties can be fully exploited…and see the speakers disappear in thin air! As an AV-preamp, the SR8/30/24 offers the same ultra high-resolution, one would commonly expect from a Goldmund 2-channel pure audio setup. The DSP-based AC3/DTS decoding really works their magic here. The end result is that the level of transparency it offers makes the viewer forget about the audio system. An addition benefit is that all decoding is software based and can be upgraded via PC-link to cater for any new decoding standards. So the Goldmund Universal Preamp will not be outdated easily because of changes in standards used by the audio encoding/decoding. In summary, despite of the high potentials of the SR8, I would not recommend it for everyone, but the most “die-hard” of the audiophiles. This is because only the most serious and dedicated audiophiles will consider going with the full-digital active crossover with their audio setup, due to additional cost and complexity. In a half-cooked solution, one will not be able to fully appreciate what the SR8 can offer. And more than likely will find the solution unsatisfactory, in one regards or another. The SR8 this case, should not be blamed, but the extent of the implementation. There are problems with the Goldmund Swiss website, specifically the email contacts provided. Hard to get in touch with any support staff. However, once contact has been established (via Goldmund USA), staffs are very helpful in problem shooting.